My boys are still young enough — they’ll be one and three years old this fall — that birthdays don’t have to be a big deal. In an age where parents often spend hundreds of dollars (or more!) on birthday parties and elaborate, Pinterest-inspired themes, though, I feel pressured to put on a big to-do for the little guys. Unfortunately, our budget doesn’t allow for extravagant cakes or expensive locations. Instead, I have to get creative. Here are seven ways I’ve found I can save money and still throw awesome birthday parties for my boys. You don’t need to be a creative genius to make your own adorable invitations. Etsy shops offer a number of printable birthday invitations for just a few dollars that fit just about any theme. Want to save even more? Use a site like Evite to send electronic invitations for free. We have a tiny house and the idea of entertaining a dozen or more people in our limited space makes me want to cry. But that doesn’t mean we can’t have a great party! Community spaces, like firehouses, local farms and petting zoos, community centers, the library, and even pools and parks, offer affordable options for parties. Make some phone calls, ask around and find a location that fits your budget. It’s normal to want your entire family to be there when you celebrate your baby’s first birthday. And your social five-year-old may think she needs her whole kindergarten class at her party. But one of the easiest ways to reduce birthday party costs is to keep your guest list short. Celebrate with your immediate family and make it a special, intimate party. Or let your child choose five to 10 friends to celebrate with. If you decide to splurge on an older child’s special event party like go-cart racing or bowling, limit the number of guests based on your budget. Tell the child to choose his two or three closest friends to share his special day. Whether you make it from scratch or from a box, making your own cake can save you a lot of money. Those of us who aren’t professional bakers can find a lot of simple decorating ideas on Pinterest. If a cake seems too hard, cupcakes are perfect solution! They’re just the right serving size for little ones, and they’re easy to decorate in most themes just by changing the frosting color and adding some decorations from the dollar store. These birthday party staples usually end up cluttering the guests’ houses with cheap plastic toys. Instead, give each child a small gift (bonus points for linking it to your theme) that you can find (or make) for a couple of dollars per guest. Some ideas: coloring books and crayons, matchbox cars, play dough or homemade cake pops. Time the party between meals so you’re not obligated to provide lunch or dinner. Instead, offer a few fun finger foods as snacks. If you’re the creative type, you can make snacks that follow your party theme. If not, cheese and crackers, a fruit plate and some veggies and dip will make most kids just as happy as a fancy spread. The longer the party, the more you’re going to need to spend on food, activities and entertainment. So keep things short and sweet to save yourself money — and headaches. Younger kids get overstimulated and overtired quickly. Keep their parties to a maximum of two or three hours. For older kids, four or five hours is a good limit. This year, I’m putting these tips into action for our birthday celebrations. We’re planning a joint party for our boys, since their birthdays are only a month apart. We’ll have a few family members over for cake and ice cream after lunch. There will be balloons to bounce around, maybe a few streamers and some gifts from the guests for the boys to open. Then it will be time for everyone to head home. It will be a short and sweet, but it’s still a celebration for the kiddos to enjoy! And as a bonus, I won’t be worried that we’ve busted our budget by splurging on unnecessary decorations or food for a huge list of guests. If you keep these tips in mind when planning your next birthday party, you’ll be able to stick to your budget, too. Which means you’ll also be able to relax and enjoy the celebration instead of stressing about how much you’ve spent! 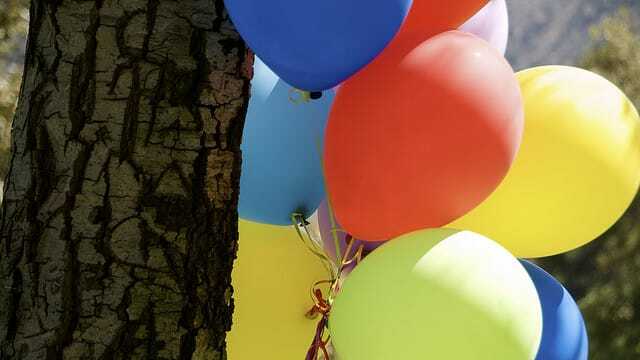 Your Turn: What tricks do you use to save money while still throwing awesome birthday parties for the kids?